Sure, you have some of the best lending rates in the area, you have amazing member service, and you are here to help members save money. Unfortunately, your members and potential members are INUNDATED with messaging that says much the same thing. Sometimes it is difficult to cut through the noise and get members to take that first step toward bringing all their loans to your credit union. This is where even small incentives and rewards can make a huge difference in your results. Just like we demonstrated in our Savings Challenge program, and in our Member Benefit Statement program, our success stories often have the common factor of offering members rewards for taking action. Why? Plain and simple, it works. 1) Offer a Big Reward in a Drawing – It is much easier to afford to give away an exciting and enticing reward if you don’t have to do it very often! For example, you could do a monthly drawing that gives away a bigger prize such as a tablet, big screen TV, or larger cash prize. Every member or potential member that goes through the Loan Saver process and submits a savings proposal request is entered into the drawing. Alternatively, every member that actually moves at least one loan to your credit union during the month is entered into the drawing. This approach has several benefits. First, it is more affordable and logistically easier to give away just one prize, rather than many. Second, you get to hype up this prize giveaway for an entire month! This should get your Loan Saver talking points out to a lot of members with that nice reward to catch their attention. Third, once they have won, you can talk about that after the give away, showing their smiling face and testimonial in your marketing material – so you are getting even more promotional mileage out of that prize budget. 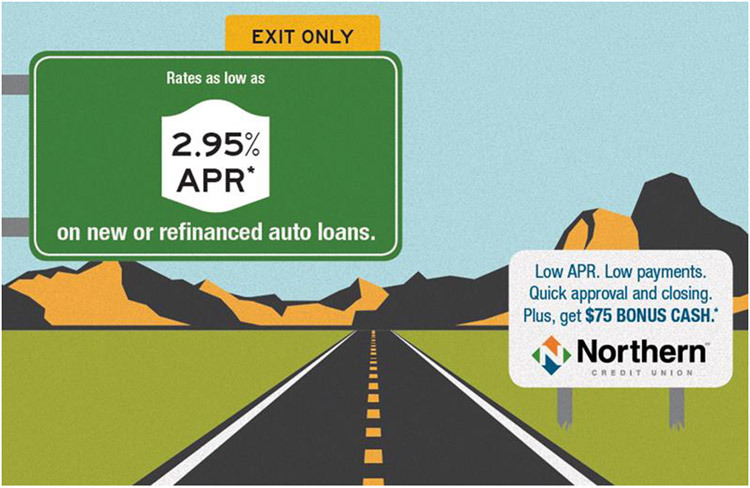 Of course the biggest benefit from these incentive marketing programs is that you are building awareness of your great rates and motivating many members to take just a few minutes to evaluate their potential savings on loans they have with other lenders. That is a HUGE win for your loan growth, and an even BIGGER win for saving money for your members. 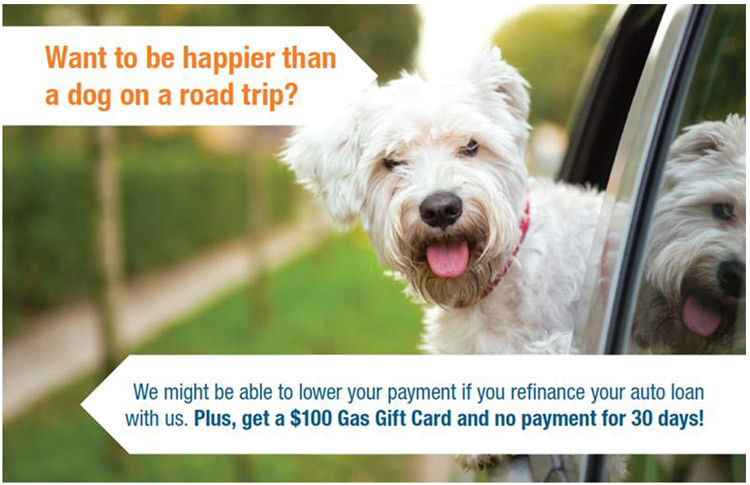 2) Offer a Smaller Reward for Every Member Who Refinances a Loan – If your marketing budget is too tight to offer a big prize in a giveaway just for trying Loan Saver savings calculations, you can instead give out those incentive rewards to only those members who have actually refinanced their loans with you! Just do the math, and this will be an absolute no-brainer. The cost of acquisition on your credit cards, auto loans, home equity lines, mortgages and the rest are HUGE compared to the relatively small financial reward that will strongly motivate your members to move their loans to you. This strategy is simple. For example, offer a bonus cash giveaway in different amounts for different types of loans. And then the important part: TELL YOUR MEMBERS ABOUT IT!! 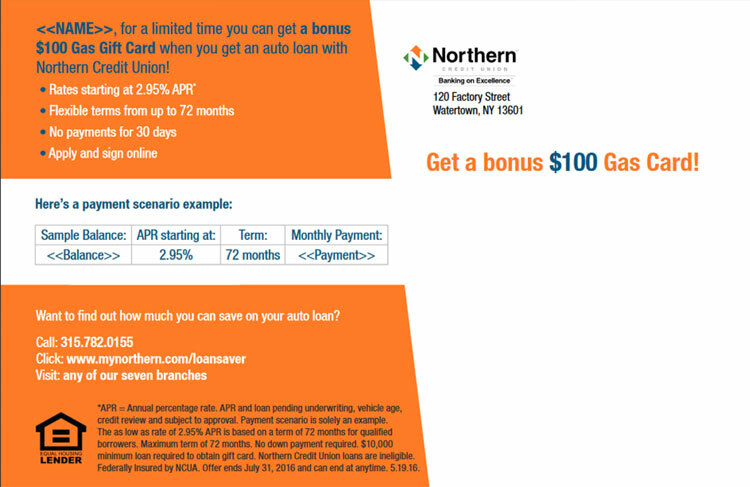 Put these incentives front and center in your marketing materials, then send your members to your Loan Saver page(s) so they can see for themselves that they will save thousands of dollars on their loans. The combination of big savings and an incentive reward will drive big results for you. See the example postcard campaigns below, showing front and back. 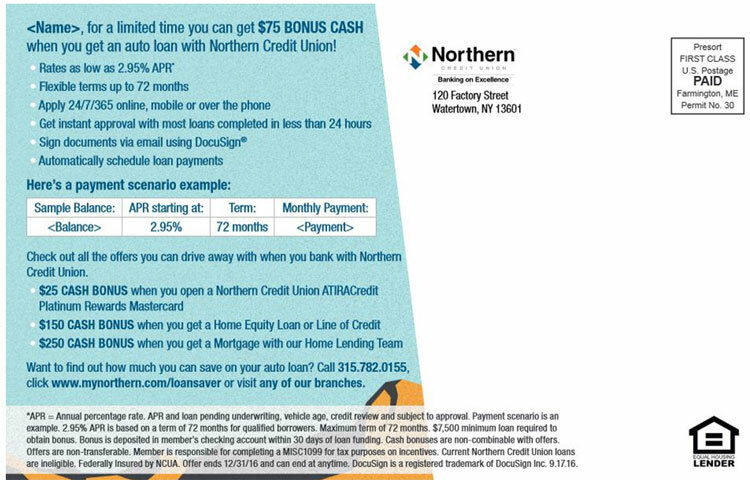 Notice that 1)the campaign sends members directly to a Loan Saver page and 2)The cash bonus for different types of loan refinancing are clearly stated on the marketing material. In this case it was $25 Cash Bonus for opening a credit card, $150 Cash Bonus for a home equity product, $250 Cash Bonus for a mortgage product, and a $100 Gas Card for an auto loan. Plus great rates, terms and service, and massive savings on loans.